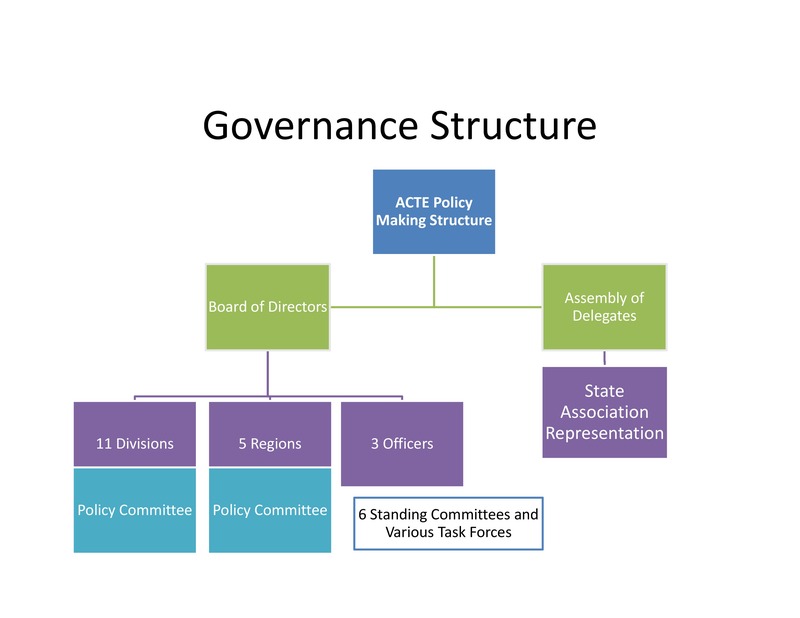 There are five organizational bodies within ACTE: the State Associations, Regions, Divisions, the Board of Directors, and the Assembly of Delegates. How do you know which is which, and who does what? The state associations are the local organizations within each state. Although the state associations and ACTE are separate organizations, they are affiliated with each other, and they work together to provide member value and services that are tailored to each state. We encourage members to join both the state association and ACTE. State associations are also organized into geographic regions. Each region hosts a conference to provide professional development and networking closer to the membership within the region. ACTE members are part of a region and a division. The divisions represent the content area focus and/or special interest group of the member. The divisions provide a specific identity to career and technical educators beyond their state or region; members are also identified by the type of career and technical education they provide or represent. The Board of Directors and the Assembly of Delegates govern ACTE. The ACTE Board of Directors contains members, including vice presidents from each region and division, as well as three officers, who are the presidents of the organization. The Assembly of Delegates, composed of approximately 200 delegates, represents members of each state association. These two groups provide checks and balances to each other, ensuring that the direction of the Association and the service to members is wisely maintained. The Assembly of Delegates is authorized to amend the bylaws and pass resolutions. The Board of Directors oversees the strategic direction, hires the executive director and amends the Board Policy and Procedures Manual.